Overview — Empower Playgrounds, Inc.
We are committed to helping empower rural Ghanaian students in their educational pursuits. Although our light-generating Merry-Go-Round projects are our principal focus, we currently have three other main project initiatives that assist these students in their educational opportunities. 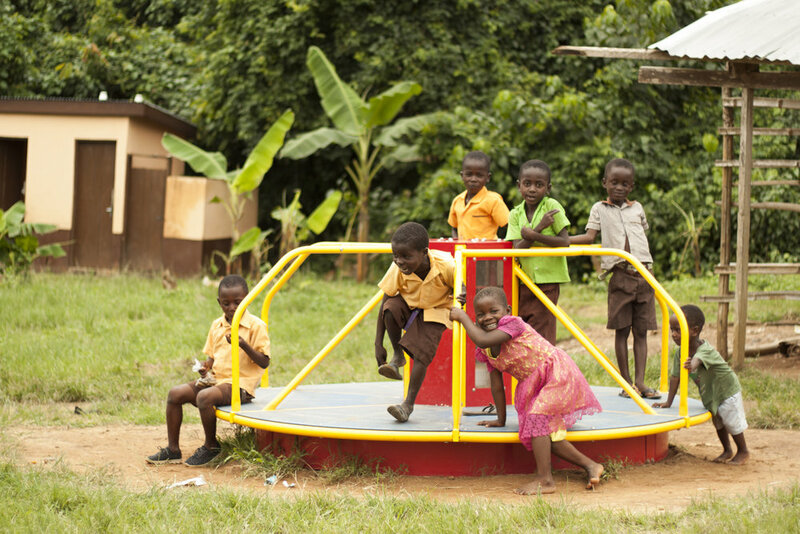 Learn more about our Merry-Go-Rounds, Science Kits, Light-A-Village, BioFil Toilets, and Boreholes. Without electricity, children in Ghana cannot study at home during their only time to do homework--night. This problem is solved when children play on EPI equipment which uses the children's energy to charge a battery. In order for Ghana to continue progressing in the technology and engineering sectors, students need to experience and develop a passion for science. The Village Solar Project uses solar power to provide opportunities for people living in remote villages to have electricity in their homes. BioFil toilets decompose human waste in a way that is odorless and sanitary. Boreholes are wells that provide clean water from deep within the ground.